I first learned about the traditional “haystacks” during my first year of student teaching. We were teaching nursery rhymes and during a lesson for Little Boy Blue, the teacher brought out these haystacks made with Chow Mein noodles and butterscotch. They were so good and so easy to make, I made some for my family. I have made them a few times during my years of teaching Kindergarten and kids still love the crunch sweet treats. 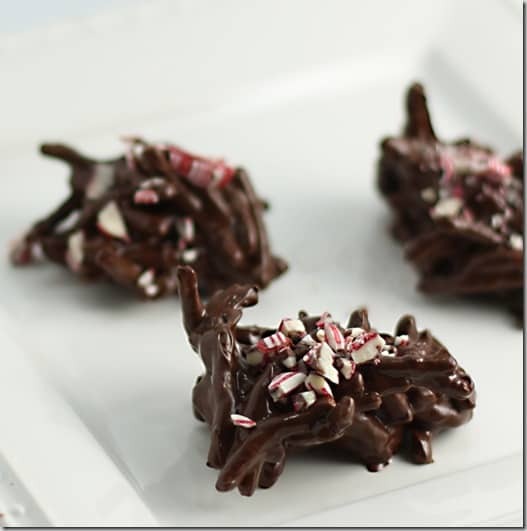 I put a new Christmas spin on these with semi-sweet chocolate and peppermint. I love the coolness of the peppermint with the slightly sweet chips. 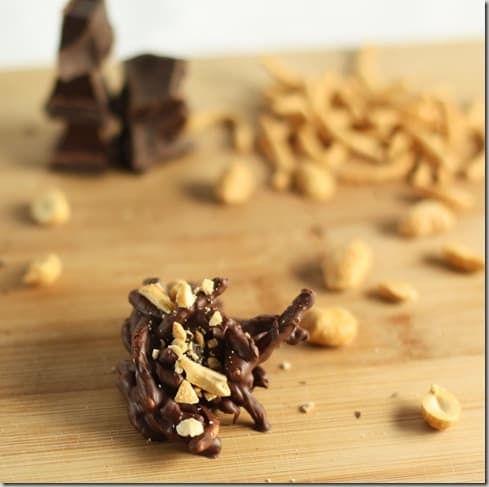 Melt 1 cup chocolate chips in the microwave. Stir in 2 1/2 cups chow mein noodles until coated. Drop spoonfuls on an oiled parchment paper–lined baking sheet. For a different version for those who do not like peppermint, use peanuts as a topping. Put a few peanuts in a bag and pound with a jar or the flat side of a meat mallet.